Crock Pot Freezer Meals get dinner for the week done! We’re getting closer to adding that shopping list. One more recipe to share and I’ll do it! We lived in Louisiana for a couple of years. In fact, my 2nd born child was born there. We keep telling her she’s Cajun, but she’s not buying it. She was almost 2 when we moved, so she doesn’t even remember it there. When we talk about our previous Cajun life, it gives me reason to start practicing the way to say New Orleans. Growing up, I’d say it, [Noo – Or lee unz] but now I know that you’re really supposed to say Nawlins. Of course, that way of saying it is only acceptable when you’re actually around others from Louisiana. The rest of the country may look at you like you’re crazy! 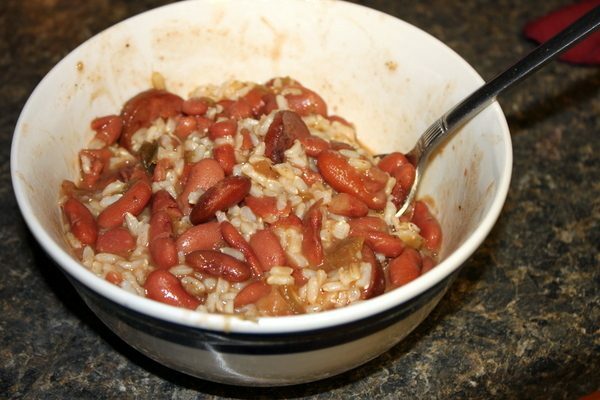 Every now and then I get the desire to make some Red Beans & Rice in honor of those Cajun memories we made. We don’t have it often and this was the first time I’ve tried it in the slow cooker, but I was pleasantly surprised at my husband’s reaction! He loved it! That’s always good news to this wife’s ears! When daddy likes his supper, mommy’s doing something right! (Not that he complains much anyway). 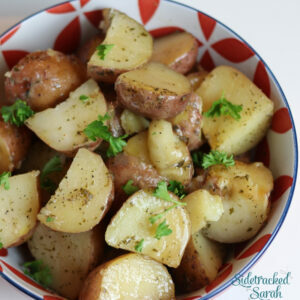 Place first 8 ingredients in slow cooker. Cook on low for 7-8 hours or on high for 5-6. Cook rice about an hour before serving time and serve the beans over the rice. Place everything but kidney beans, water and cooked rice into a gallon size freezer bag. Label & Freeze. On cooking day, remove from freezer night before (or throw it in frozen that morning). Add kidney beans and water and cook as directed. Cook rice about an hour before serving time and serve the beans over the rice (or mix it up like I did). Food for Thought: I wasn’t loving the texture of the smoked sausage, but my husband didn’t mind it at all. I’m thinking about precooking it (browning it a little) before I freeze it and then throwing it into the crockpot in the last hour. It seemed to get a little mushy after cooking in liquid for so long. My husband who is normally sensitive to meat textures didn’t mind it at all, so it could just be a weird preference of mine. The only drawback to doing it in the last hour would be that it wouldn’t be flavoring the beans the whole time they’re cooking. It may not matter though with the green pepper, onions and seasoning. Just something you may want to think about with this recipe. This recipe looks so good! I love red beans and rice. The only thing I would do differently is with the red bean prep. You can get poisoned if they don’t reach a high enough temperature. It’s pretty rare, but I’d rather be safe than sorry! I have never heard of that. Thank you for letting me know. I'm guessing that as long as you cook this on high it would eliminate that potential problem.